In the near future, a Virtual Reality Massive Multiplayer Online Role-Playing Game (VRMMORPG) called Sword Art Online has been released where players control their avatars with their bodies using a piece of technology called: Nerve Gear. one day, players discover they cannot log out, as the game creator is holding them captive unless they reach the 100th floor of the game's tower and defeat the final boss. However, if they die in the ga..
Own Sword Art Online - Ordinal Scale Blu-Ray from Deff, DVD, Blu-Ray & 4K Video Specialists - Free UK Delivery..
Own Sword Art Online - Ordinal Scale DVD from Deff, DVD, Blu-Ray & 4K Video Specialists - Free UK Delivery..
Own Sword Art Online - Part 2 DVD from Deff, DVD, Blu-Ray & 4K Video Specialists - Free UK Delivery.. Although Kirito cleared SAO and returned to his real life, his adventure was far from over. Asuna is in a coma in the hospital and Nobuyuki Sugou of RECTO, the company that took over SAO's property, is trying to get married to her! Hearing that Asuna has been spotted in the virtual game called Alfheim Online (ALO), Kirito decides to dive into the virtual world once again. With the help of Leafa, Kirito rushes to the World Tree where Asu..
Kirito and Leafa have finally reached Central Arun, the largest city in Alfheim by the foot of the World Tree. Kirito is determined to face the dangers of the Grand Quest to rescue Asuna. With the support of the Sylphs and the Cat Sídhes, will Kirito save Asuna in time or will he be crushed by Oberon's evil plans?!.. 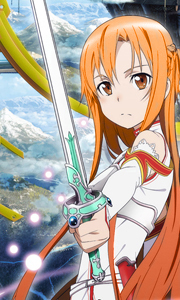 Own Sword Art Online II - Part 1 Blu-Ray from Deff, DVD, Blu-Ray & 4K Video Specialists - Free UK Delivery..
Own Sword Art Online II - Part 1 DVD from Deff, DVD, Blu-Ray & 4K Video Specialists - Free UK Delivery..
Own Sword Art Online II - Part 2 Blu-Ray from Deff, DVD, Blu-Ray & 4K Video Specialists - Free UK Delivery..
Own Sword Art Online II - Part 2 DVD from Deff, DVD, Blu-Ray & 4K Video Specialists - Free UK Delivery..
Own Sword Art Online II - Part 3 Blu-Ray from Deff, DVD, Blu-Ray & 4K Video Specialists - Free UK Delivery..
Own Sword Art Online II - Part 3 DVD from Deff, DVD, Blu-Ray & 4K Video Specialists - Free UK Delivery..
Own Sword Art Online II - Part 4 Blu-Ray from Deff, DVD, Blu-Ray & 4K Video Specialists - Free UK Delivery..
Own Sword Art Online II - Part 4 DVD from Deff, DVD, Blu-Ray & 4K Video Specialists - Free UK Delivery..